Consultants who must be in action to win business, deliver value, and build a thriving firm, often find themselves stuck. Stopped. Zippo progress. Has that ever happened to you? If so, read on. If you ever find yourself at a standstill, you may be feeling overwhelmed or uninspired. Worse, even when your enthusiasm burns bright for your highest priorities, you may find yourself procrastinating. The real problem? The wrong person is in charge. In terms of your actions, you’re always in the driver’s seat; however, when you’re feeling as stuck as a turtle in a glue trap, it’s because the wrong version of you has control and is stomping on the brakes. Research shows that emotions drive actions, with cognitions racing to catch up and rationalize behavior. Other studies prove thoughts determine emotions and, therefore, are the root of action. Still other research demonstrates that when you take action, you change your feelings and thoughts to align with your behavior. Everyone’s right. There’s a feeling you, a thinking you and an acting you. The feeling you directs your passion by setting strategy, marshals your confidence so you can win new business, and urges you to deliver the highest quality work. This is you, the Therapist. The thinking you balances risk against reward, casts away idle dreams that could siphon energy away from real progress, and prioritizes your to-do list. This is you, the Physicist. The acting you moves plans into action, powers through obstacles, and notches concrete accomplishments. This is you, the Bricklayer. Each you affects the others. Each is important. Changing any version of you will alter your trajectory as a person and a professional. The trick is deciding when each you has priority. When to feel more than you think and act. When to push the Therapist off stage and let the Physicist carefully ponder your decisions. When to put your brain in park and simply stack bricks. Consultants have a tendency to let the Physicists run the show long past the time those logical voices should have been locked in windowless closets with their accelerometers. Getting and staying in motion requires you to decide to be the Bricklayer. Designate specific times each day to assume that role, and in those moments let action lead you, not feeling or thinking. Refuse to indulge in the luxury of being the Therapist or the Physicist. 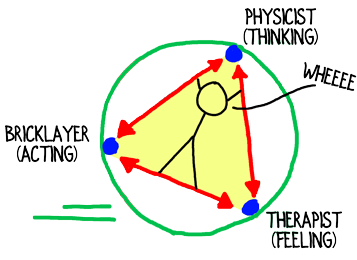 The Bricklayer has to trust the Therapist and Physicist. When you step into action mode, accept that the strategies and plans you’ve formulated are sound. The temptation to question what you’re doing is actually the siren song of your Therapist and Physicist clamoring for attention. Choose to be the Bricklayer. Set aside introspection, indecision and procrastination by committing to acting on your prior decisions. Laying bricks—being in action—is meditative, nourishing and rewarding when you embrace it; when you step fully into the role and turn off your buzzing mind and demanding heart. There is joy and accomplishment in simply doing. There’s not just how to being in motion, there’s who. You can be the Bricklayer because you are the Bricklayer. Just let that part of you take control of the car, and when it’s time to change drivers, you’ll be thrilled with how far you’ve traveled. How do you put the Bricklayer in charge and surge into motion? A great tip, David. Especially important for those of us transitioning from working in a corporate environment to an independent consultant role. Thanks! Robert, congratulations on your transition and welcome to the wonderful world of independent consulting. David, I noticed that roles of Therapist, Physicist and Bricklayer are similar to the goals of consulting projects you describe in you course – Decision, Plan, Implement – and to effective consulting modalities – Detective, Process Expert and Outsourced Professional accordingly. Working for clients you recommended to focus at either adjacent pair of the latter trio because one can’t cover everything effectively. If I choose to focus on Process Expert and Outsourced Professional for clients based on my personal strengths, does this mean I should seek external advice/support/partnership to strengthen Therapist function for my firm? If so, what’s the best way to do so? Anatoli, that’s an outstanding insight. There’s definitely a parallel between the different types of consultants and the different roles we play in working and building our firms. I’m impressed you pulled those together. If your strengths are creating a plan and implementing, then you might reasonably decide you need a good strategist to help think through the direction of your firm. Ironically, small (solo) firms tend not to bring in strategic help, while boutique firms that have proven they know how to build a successful practice are more likely to bring someone like me in to do a deep dive on strategy. Good strategy tends to rest on: knowing the right questions to ask; undertaking good, unbiased research to answer those questions; using sound judgment, vision and insight to review the answers to the questions asked. Judgment may be hard to teach/learn; however, you can find many of the right questions in books and online. Or, you can seek someone who has proven experience asking those questions, conducting that research and/or using that judgment. I praise myself for the ability to ask strategic questions and find strategic connections while working for clients, but asking myself is a whole different ball game. Still looking for a mentor/board member. You are on my short list 🙂 … after I figure a solution to a chicken/egg situation with business growth. Anatoli, I’m not sure the chicken/egg situation you’re referring to; however, board members vs. mentors is an interesting topic. For most small businesses, I think board members should be conduits to business. A mentor, on the other hand, is a specialist in the business you’re in and can give pointed, tactical instruction. Tend to agree with your distinction. Makes me looking for a mentor, except I seek both strategic and tactical input. What’s strategy without tactic? -Wishful thinking. What’s tactic without strategy? – Blind shooting. Anatoli, ultimately you’re responsible for directing the execution for your consulting firm. You can (and should) delegate parts of it; however, it’s up to you to make sure the execution is of outstanding quality. As an entrepreneur, your success depends far more on proper execution. So-so strategy and outstanding execution will outperform fabulous strategy and mediocre execution.